CHARLIE HEBDO MASSACARE: TO KILL A MOCKINGBIRD ! 7th January 2015,Paris; 13 people lay dead after two gunmen had attacked the office of the French satirical weekly Charlie Hebdo and massacred members of the Charlie Hebdo editorial team as well as its top caricaturists. Shouting “Allahu Akbar” the assailants triumphantly left the building and claimed that the Prophet Mohammad was avenged and that Islam was safe again. Paris continued to reel under Islamic terror when four more were killed in a hostage situation in a Kosher (Jewish) Supermarket. The hostage taker, Amedy Coulibaly (who claimed allegiance to the ISIS), was gunned down as also the two out of the three Charlie Hebdo assailants, Algerian brothers Cherif Kouachi and Said Kouachi (al Qaeda). The third, Hamyd Masoud surrendered. The French Government suspected an international conspiracy behind the three day carnage. Eventually the Al Qaeda In Yemen (AQIY) took responsibility for the attacks on Charlie Hebdo. What provoked the carnage? The answer contains uncomfortable truths for the victims as well as the perpetrators. Charlie Hebdo started in 1970 after its predecessor the “Hara Kiri” was banned for mocking the death of ex-President Charles de Gaulle. It remained out of print from 1981 till ’92 when it was resurrected by the efforts of François Cavanna (editor 1969 – 1981),Phillipe Val (editor 1992 – 2011). The magazine is irreverent, satirical, provocative and non-conformist while dealing with religion and French politics. Its editor Stéphane Charbonnier (Charb), who was killed by the gunmen, had once described the magazine’s positions as left-wing, secular, and atheist. It has caused maximum controversy when covering religion, particularly in the depiction of the Prophet Mohammed. In 2006, it provoked protests when it featured a weeping Mohammed with the headline “Mohammed Overwhelmed by Fundamentalism.” And also featured reprinted cartoons from the Danish newspaper Jyllands-Posten that caricatured the Prophet.In 2007, it again caused furore when it published cartoons of Mohammad carrying a bomb in his turban. In 2010,it supported France’s “burqa ban” through the caricature of a naked woman. In 2011, its offices were fire bombed when a Charlie Hebdo edition supposedly “guest edited” by Mohammad was taken out with a Mohammad cartoon announcing “100 lashes of the whip if you don’t die laughing” and titled Charia Hebdo (a refence to Sharia Law). 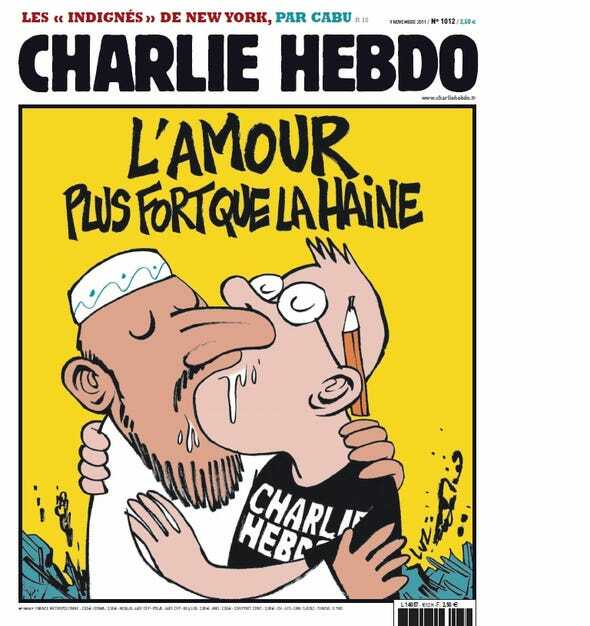 In response – the magazine published the cartoon of a Muslim man kissing a cartoonist ! In 2012, an edition had a cover showing an orthodox Jewish Man pushing a Muslim man in a wheel chair and titled “Intouchables 2” a spoof on a French movie “Intouchbles”.It also carried a spoof on the malicious, divisive and globally decried Islamophobic internet movie “Innocence of Muslims”, by depicting a naked Mohammad in pornographic positions! This was done against the advise of the French government. The editors reacted to Muslim chagrin by saying that the fire bombers were “stupid people”, that the magazine conforms to French free speech laws and not Koranic and that they could be least bothered about the reactions or laws of Kabul and Riyadh. They admitted that they were against religion but depicted the Prophet especially to provoke and shame. The Amul ad depicts the carnage in Paris.The Eiffel Tower is almost falling over under the onslaught of extremists with storm clouds gathering and paper, ostensibly depicting drawing sheets, strewn all around. The Amul Girl is shown as defending free speech with a drawing pencil in one hand and a paint brush in the other. The Tag Line…Paris Is Reeling…is a statement on the unprecedented attacks in Paris and the “IS IS” in red is a play on the suspected role of the Islamic fundamentalist movement Islamic State in Iraq and Syria. This is an incomplete representation as the two main suspects had announced allegiance to al Qaeda. Secularism is the de facto official religion in France. Inasmuch that the French have twice imprisoned recalcitrant Popes in 1798 and 1809 who tried to resist the Revolution. In 1905 the French Third Republic decreed the separation of the church and the state to ensure Freedom of Thought. This entailed strict official neutrality known as laïcité – absence of religious involvement in government affairs and vice versa. French Identity is essentially non ethnic and non-religious and is now under strain due to the immigration of people of colour and multi ethnic identities from the former colonies. It’s in this backdrop that the Charlie Hebdo editorial line is to be seen. Strictly secular, Charlie Hebdo swore to safeguard laïcité. It had subsumed for itself the right to equally offend all, also known as – equal opportunity blasphemy- with irreverence. It intended to subject to brutal interrogation, any self-sanctified institution especially religion. It aimed at making humorous attacks so common on the most sensitive issues and concepts that these would get defanged and lose their control and illogical hold on the people. Charb was loathe to self-censor and would never indulge in appeasement of a group or two at the cost of his core ideals. This courageous editorial underpinning put Charlie Hebdo on a path of direct conflict with the six million Muslim immigrants of France and the extremists within them. These are the most disenfranchised ethnic grouping who have also felt targeted by the government especially when the latter banned head scarves and veils. Charlie Hebdo demonstrated a strange naiveté when it ventured into these troubled waters upholding laïcité but ignoring the transforming ethnic realities of France. Its irreverent and offensive attack on the most sacred entity for the Muslims – Prophet Mohammad- was seen as racial and humiliating by a marginalized ethnic grouping. These caricatures thus became the catalyst for the inevitable outburst of a suppressed and discriminated minority made to feel unwelcome in France. And resulted in a senseless carnage leading to the death of 17 people. The rise of Islamic fundamentalism in the younger generation is a failure of the French State especially when the original immigrants assimilated so well that they are at the forefront of the voices against extremism. The French need to accept the changing paradigm of the ethnic composition of France. Marginalisation breeds a pronounced sense of identity and leads to overt display of religious symbols and beliefs which cannot be stemmed by stringent laws alone. Without serious thought being given to the root causes of alienation the next incident too should be round the corner as Charlie Hebdo has responded to the massacre by publishing yet another Mohammad Cartoon with the latter holding the “Je suis Charlie” placard and saying “ all is forgiven”. The Muslims too need to introspect as to why is that when Charlie Hebdo depicted the Pope with a condom, Marie Le Pen shaving pubic hair and Michael Jackson as a skeleton immediately after his death that none of the groups resorted to large scale protests, fire bombings, shootings, executions and hostage taking? Free speech is a modern concept which is far removed from Islamic tenets and is a cherished value of the Western nations. Such blatant attacks will lead to nations reacting in a manner which will threaten to further exclude the Muslim community and typecast them .If the Muslims aspire for a better life as immigrants then they must assimilate and learn and develop tolerance and shun extremism.Western nations too must ensure that the right to offend is moderated. Muslims also need to give serious thought and voice to the demands for reform in Islam keeping in mind the changes in the 1400 years since the compilation of the Holy Koran.It is not their belief which is coming in the way of assimilation but the manner of interpreting the teachings of the Prophet and the Koran. There is a lesson for us Indians too especially in the backdrop of the protests against the Aamir Khan starrer -PK. Extremists all over the world speak the same language of intimidation when they want to subvert free thought.And they need to be resisted. And the rabid protestor could also be reminded that if he feels belittled by the depiction of certain practices and concepts which have crept into the Hindu religion then why doesn’t he protest about these practices too while demanding limits on free speech. Previous PostCONVERSION CHARADES:STUPIDITY IS A GIFT OF GOD TOO..LETS NOT MISUSE IT.Next PostIPL SPOT FIXING SAGA: INDIAN CRICKET’S “WATERGATE” MOMENT ! True!!!! !So much for free thinking and free speech. Nicely presented…buddy keep it coming. Free speech comes as a package and that’s with self censorship.Pushing the envelope is fine but the overall perspective can’t be lost while dealing with a particular situation or group of people. deep thoughts put forth by you in simple words.. but not to mention leaves a lasting impact. It takes two to tango.and when both don’t know what’s the next step then it’s like courting disaster. France just learnt it the harder way. Absolutely. Although with an eye on the plot not getting lost in the cacophony of allegations of racism or targeting of the Muslims.Right to offend is an important tool for sustaining democracy and secularism. Especially since the other option is an Islamic State like polity and governance. Very well written…lucid way to put across interesting and important point.. The topic is an open and shut case for most but to the discerning the real fault lines will emerge clearly. France has missed a trick in not adapting to the demographic and societal changes enveloping it. It’s citizenry, government, immigrants and the media need to evolve collectively to deal with the changes and the related impact on French identity and ideals. Unfortunately life and it’s foibles make us serious enough to lose the child within. The courage of Charlie Hebdo is commendable for sure but I think they have taken the right to offend a little too far as well.Showing sensitivity towards others doesn’t mean that they forfeit the right to point out the wrongs.A little moderation would have ensured a broader acceptance and less carnage. A very well written and analysed article sir. The incident calls for an introspection. There should be a balance between equity and empathy and different forms of satire may be encouraged but they need not be provocative or insulting to faiths. Though France is a free-thinking country and the French government had said that satires will not be prohibited, it is the need of the hour to pass certain legislations on freedom of expression at least for maintaining social harmony. Yes,moderation is the key and even by weighing in sensitivities a publication can still retain its independent flavour. In an increasingly polarised world ,extreme views will always breed a negative fallout be it against IS or against a harmless publication. Muslims though need to introspect about the inherent intolerance that is now a part of their faith. Insightful blog sir. Charlie Hebdo says it’s atheist and secular that’s as confused as it gets just because they percieve the world in stereotype (modern) everyone should be subject to the garbage they call a newspaper. To analyse something let alone deplore it first requisite should be knowledge not half baked but full. Be it the cartoons on Christianity or Islam or poor president Gaul they literally can’t be painted with the same brush. Painting prophet on a donkey or a bomb in his turban makes the Charlie Hebdo cartoonists no better than the one’s who make pornographic cartoons. Did muhammad write in Koran about building bombs or is there any mention of beheadings in the text. What the followers are doing needs to be condemned but I would like to see the greats at Charlie Hebdo do a cartoon of a virgin mother giving birth. Or better still start believing in something, anything.